The Rogue bay still continued to kick out plenty of Chinook for angers trolling spinnerbait rigs. The Rogue bay and Chetco bay continue to please anglers as they continued to catch a variety of Chinook sizes last week. The Rogue bay was stellar-hot with an inordinate flux of 2-year-old Chinook, commonly known as jacks. Anglers didn’t seem to mind catching the 22- to 24-inch fish because they were looking forward to next year’s crop of kings. 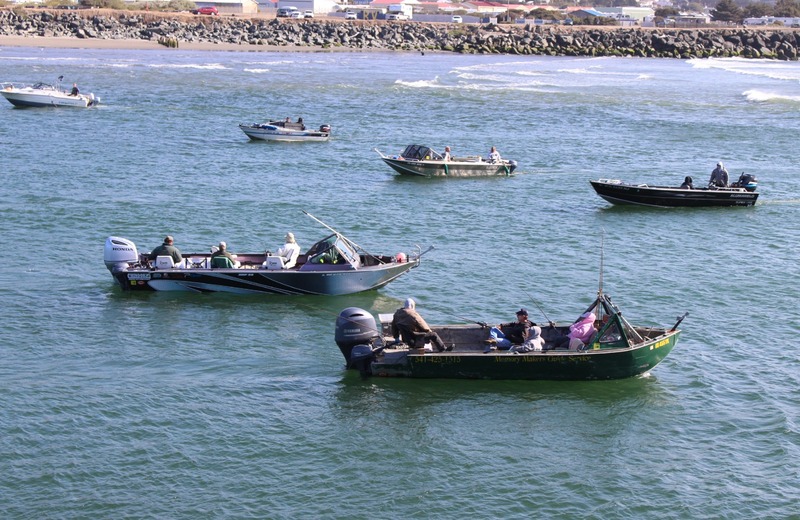 Remember that a large percentage of jacks will remain in the ocean to come back next year as 3-year-old kings, and that has the local business community in Gold Beach looking forward to next year’s fishing. When I was at the Rogue mouth on Tuesday, I counted at least 30 boats congregating at the mouth near the turn of low tide in mid-afternoon. And anglers were hauling in both jacks and adult Chinook like gangbusters. So all-in-all, I would say that anglers are catching about a 50-50 ratio of jacks to adult Chinook. Every guide boat’s fish bag overflowed with bright, shiny jacks, with about half of the mix being adult Chinook ranging from 10 to 28 pounds. Bill Horne from Ben Lomond, California fished several days on the Rogue bay with guide Chris Young, and just slew the fatted king. Carey mentioned that the great fishing has been an economic windfall for businesses in the Gold Beach area, including restaurants and businesses. 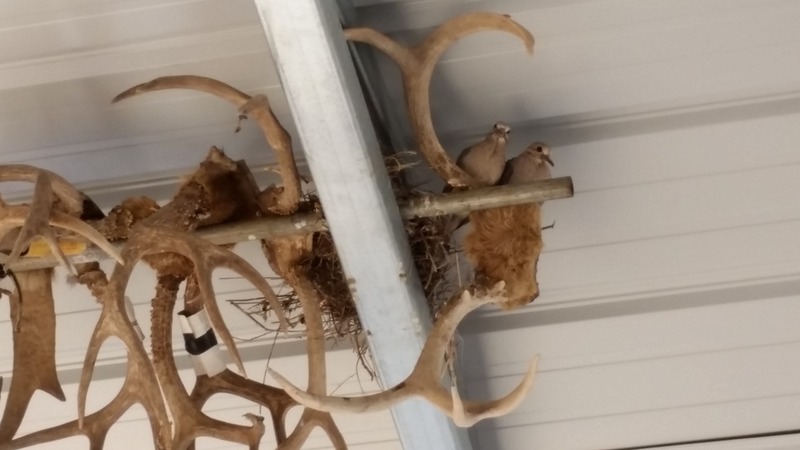 “A lot of people are commenting about how hard it is to find a motel room or a restaurant that’s not packed,” noted Carey. And Jim Chatgin from Red Bluff, California didn’t do too shabby last week either while fishing with guide John Anderson of Memory Makers fame, who caught some nice kings while fishing with Anderson. Anderson has been doing extremely well, managing to get his clients’ rods pinned by aggressively-biting Chinook every day. 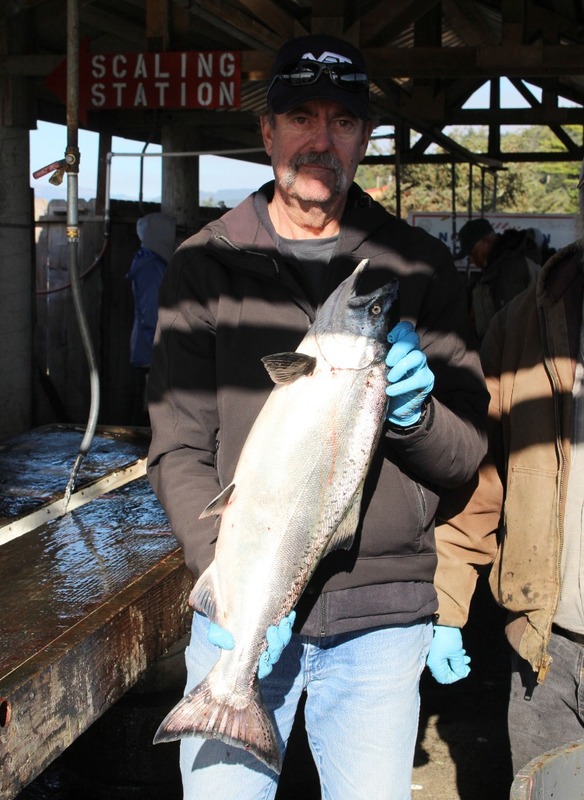 Don’t forget that there will be an influx of Chinook heading up the Rogue River this month and through October. The Curry Anadramous Fishermen strives to release at least 75,000 Chinook smolts every year at Indian Creek. And all these Indian Creek fish are fin clipped. So if you catch a hatchery fall king, that’s positive identification that it’s an Indian Creek king. If it’s wild, that identifies it as the regular component of the Rogue fall Chinook fishery. Indian Creek is located about 1/4-mile above the Highway 101 Bridge, just across from Lex’s Landing. And if fall Chinook doesn’t suit your fancy, try your luck on summer steelhead. New numbers are being counted by the hundreds by ODFW every day in their nets at Huntley Park. “We’ve got just a massive amount of summer steelhead in the river this year,” noted Carey. There has been the philosophy that these summers don’t really eat so much until they get up to Agness, at places like the notorious Hotel Riffle. But Carey says that the half pounders are being caught like gangbusters in the lower river above tidewater. 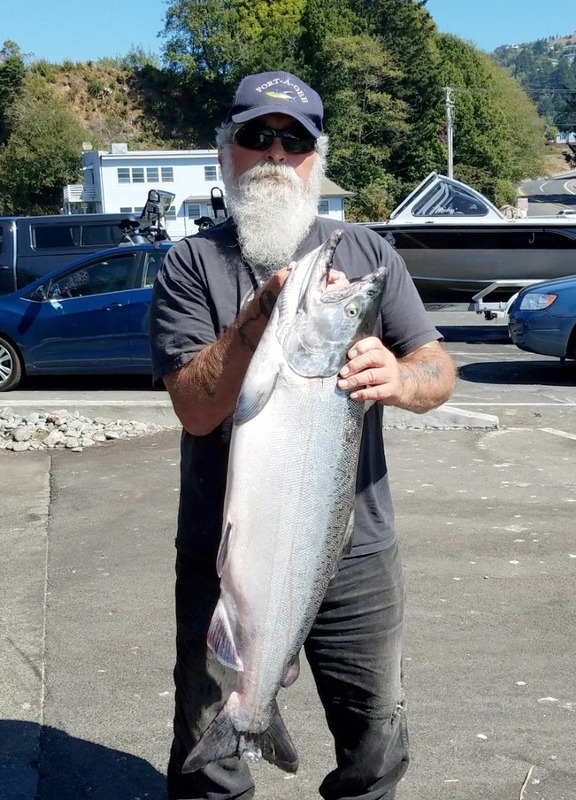 Some anglers who have been trolling the Chetco bay have been rewarded with some savage take-downs of Chinook ranging from jack sizes to 30 pounds. The best setup has been trolling the spinnerbait/anchovy rig. There have also been a few kings falling for the cut-plug herring. The best time to fish the Chetco bay is during an incoming tide. So for your best luck, you will want to be in the water from 3 hours before the turn of high tide, to 2 hours after the turn. Tuesday produced at least 15 Chinook, while Wednesday and Thursday were still providing a healthy amount of savage take-downs from the big kings. Remember that the ocean is now closed for the retention of Chinook. So you will want to trolling inside the bay. The boundary between the bay and the ocean is an imaginary line drawn between the north and south jetties. Make sure that your boat stays well within the river boundary of this line. If your fish happens to run into the ocean, do not chase the fish down, as you can be sited by ODFW for fishing in the ocean. If this scenario should occur, tighten down your drag and put the screws to the fish, and try to steer the salmon back inside the bay. 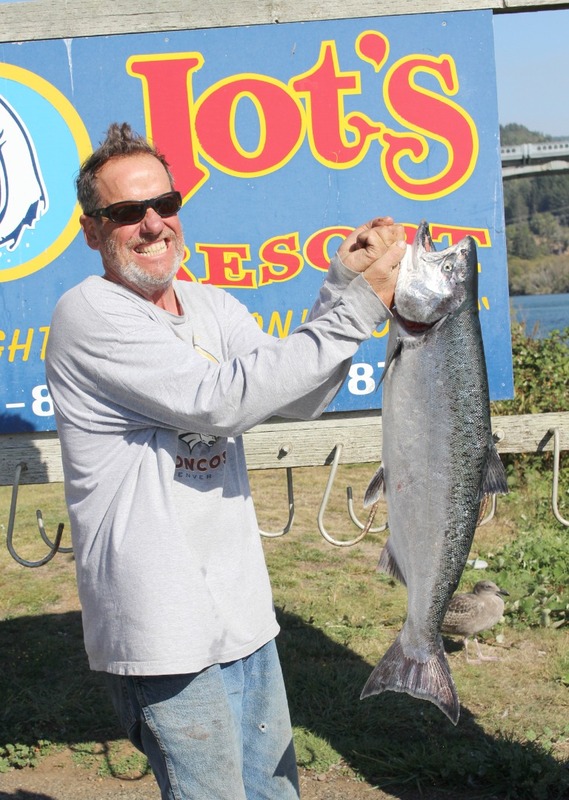 The large amounts of Chetco bay kings being caught of late bodes well for the upcoming October ocean fishery which will be taking place on the weekends of October 6-7 and 13-14. 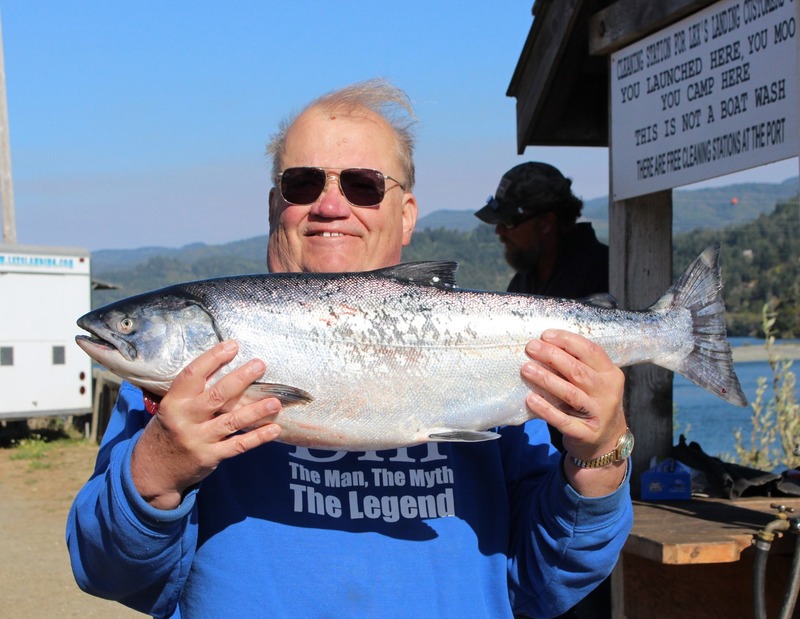 If you should happen to luck into a Chetco bay king, and you want to head outside the jaws to do a little bottom fishing, make sure to bring your salmon inside the port and put it in your ice chest. Only after then, can you safely fish outside the jetty jaws for rockfish and lingcod, the action of which has been off-the-charts stellar. Remember that the rockfish limit has been bumped back up to 5 fish a day. Crabbing has also been white-hot for anglers setting their pots between 40 and 70 feet of water. 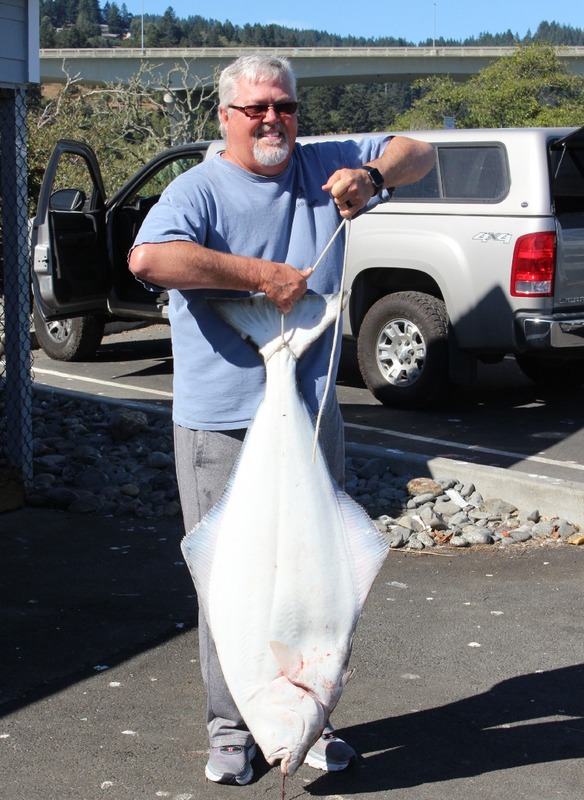 Jim Chatgin from Red Bluff, California fished the Rogue bay with guide John Anderson last week and caught this nice, bright king while trolling a spinnerbait. 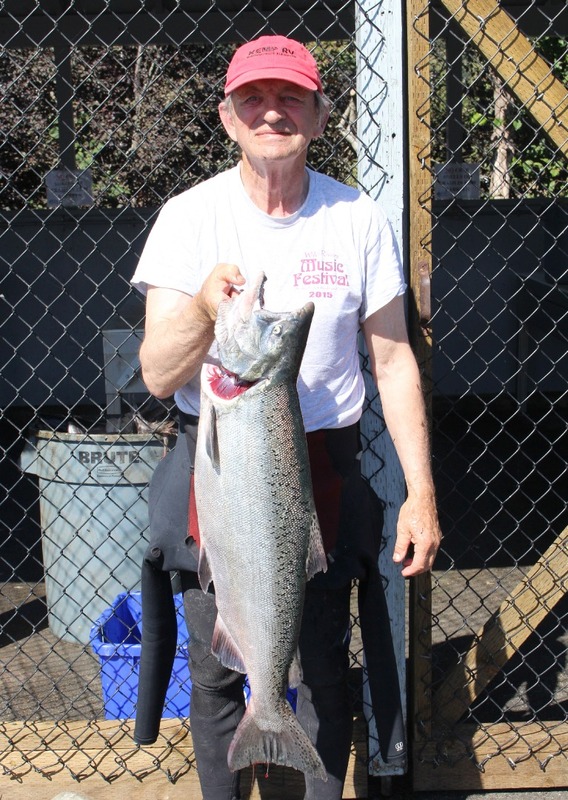 Bob Rose and his wife nailed two beautiful 20-plus pound Chinook in the Chetco bay while trolling their favorite bait setups on Thursday. Norm Hanscam of Brookings, Oregon nabbed this bright king on a spinnerbait while trolling the Chetco bay last week. Rogue River guide Chris Young limited out his clients on Chinook last week while trolling the Rogue bay, including this nice bright king held by his friend Bill. Anglers trolled both directions at the mouth of the Rogue bay last week. Here, guide John Anderson leads the pack in the forefront.